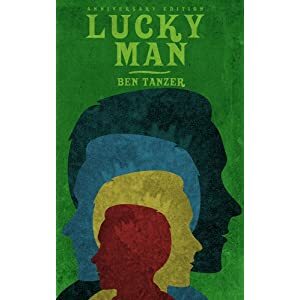 Largehearted Boy: Book Notes - Ben Tanzer "Lucky Man"
Book Notes - Ben Tanzer "Lucky Man"
Ben Tanzer's debut novel Lucky Man, initially published in 2007, is an arresting and darkly comic coming of age story told by four friends. There is looking back and then there is looking back on looking back. Which is to say that it is somehow the five-year anniversary of the release of my debut novel Lucky Man and I have this new anniversary edition coming out. The release is forcing me to look back, and I have an endless array of feelings associated with doing so, especially because it is Lucky Man, which like so many debut novels, involves looking back itself, to the people we once were, how we changed, what happened along the way, and the music we were listening to as it all went down. One piece of this has to do with the song "Lucky Man" itself, its vibe, and what I was feeling when I wrote the book and edited it. As a song, it's not one I necessarily listen to now outside of the random appearances it makes as it shuffles by on my iPod. But it meant something to me then, just as the songs I chose for the book meant something to me at the ages the characters listen to them, even if like "Lucky Man," I don't listen to them nearly as much these days. That's the thing about looking back though, it's full of memories, feelings and an assortment of associations we didn't even realize had faded away. Every office has that person. Or at least I hope they do. The geeked-out, indie-loving mix-tape guru dude or chick. I have been at my office so long now that I have worked with three such iterations of this archetype, all of whom have hooked me up with new music and all of whom who have had a way of making me feel old and out of touch. The dude in the case of "Lucky Man" handed me a mix-tape one afternoon titled British Summer Mix 2005. There were songs from The Smiths which I knew well, and others from a band named Coldplay I had not quite ever listened to before that. Overall, it was good, pleasant, not in the vein of the louder things I was listening to then, X and The Ramones, but fine. One day though while editing the manuscript for what was then untitled, but would soon become Lucky Man, the song "Lucky Man" by The Verve came on and it was all there, the touch of sadness and impossibility I was capture in the text, the rhythm I sought, the lyrics "Happiness, more or less," and that title, which really spoke to something I was aiming for with the book as well, what's luck really, and how do we define it? I also remembered that "Lucky Man" was the title of Michael J. Fox's memoir and I couldn't help but believe there would be people who might buy my book by accident while thinking they were buying his if I ever got someone to publish it. It seemed possible right? I hoped so. And I still do. Neil Young and the Violent Femmes were playing everywhere and at every party I attended when I was in high school, and it was impossible to write a party scene as I did early in the novel and not have these songs make an appearance in the background. What's funny of course is that "Add It Up" was current and still transcendent then, and "Cinnamon Girl" was anything but current. I suppose though that "Cinnamon Girl" was where we tended to start the night, mellow and plaintive and full of longing and "Add It Up" was where we finished, manic and high and hoping to get laid. Speaking of getting laid, I should add, that what we didn't listen to then was hair rock, but when I was recently asked to write a piece for an anthology called Hair Lit focused on the music of 80's hair bands, I chose to write a story based on "Wanted Dead or Alive" by Bon Jovi, a song which would have also been popular then, but one I never recall hearing at any parties anywhere. What struck me as I wrote this piece, however, is that Neil Young sang of politics and heroin, things we did not care about and would maybe never dabble much in, heroin certainly, and yet we listened to him relentlessly regardless, and Bon Jovi spoke to finding girls and getting laid, which is about all we cared about, and maybe still do on most days, but we never could see the point of listening to him at all. Not unlike the characters Louie and Sammy in Lucky Man, I moved out to California after college with a friend, we drove, we took our time, we took a lot of drugs and we listened to Graceland, Legend and Upstairs at Erics repeatedly on the trip. I believe there must be some connective thread between these discs, but I'm not sure what it is. I don't even know why these were the only discs we seemed to have on hand when we left for the trip. I do know that they never got old. I also know that this was the one stretch in my life where I wasn't so into music, new music anyway, finding it and devouring it, and obsessively listening to something fresh and exciting. I suppose nothing felt fresh to me then, which is partially why I, and by extension these characters, wanted to move West in the first place, to seek something new and different. On a side note, when I was scheduled do a reading in New York for Lucky Man's initial release, my then ten year-old nephew asked me if he could attend. I told him I honestly didn't think there was a single page in the book I could read in front of someone his age, to which he replied, but the quote on the back cover references bon bons, you can't read about bon bons in front of me? I wasn't sure which scene he could possibly be referring to, so I took a look at the quote: "We are only one day in at this point, but we have already settled into a steady diet of Pop Tarts, Twizzlers, bong hits, and the USA Today sports page." At the time I thought to myself, well at least he doesn't know what bong hits are yet. Now though he is practically the age of the characters in the book when it opens, which leaves me very worried, and doubtful, we could have the same exchange today. The goal when talking Dead songs is not to come off like a trippy, Deadhead freaker, full of wannabe miracles, love and life-changing moments. Yet there is no other way to do it, none, not for me anyway. The fact is, I did once wander into Jerry warming-up for the second act of a show during a bad trip as the character Louie does and the experience was transformative. Listening to the Dead also made me want to listen to music again, all kinds, and for me there is a path from the Dead to the Beastie Boys to the Ramones and beyond. And of all that happened when I moved to California and began to embrace the fact that there really was more out there than I thought knew. Still, there was a moment when I wondered if I should cut back on drugs, reconnect with my family, my old friends and move back east, while also struggling with whether I could ever really leave California. My feelings about the rightness of the move had been clinched just months after arriving, while tripping in the back seat of a car as we drove down Highway 1 to Santa Cruz and I listened to "Estimated Prophet" for the first time. All of which led me to decide at the final Dead show I was attending before moving back home, that if the Dead somehow decided to play "Estimated Prophet" that night, I would not allow myself to move under any circumstances. It would be a sign, done, no questions asked. They didn't play it though, and soon thereafter I was off and running again. Looking back on the time period around Lucky Man's initial release I am struck by the whiplash I was experiencing musically as I found myself caught between my then five year-old son's desire to be all Disney all the time, including, but not limited to High School Musical 2 and anything Miley Cyrus; his disdain for everything else, especially that which I was listening to; and my desire to get as far away as I could from not just High School Musical, but at times parenting itself, which is when I stumbled into Avail, Be Your Own Pet, The Hold Steady and Ike Reilly, all of whom I held onto and still won't let go of. That said, my son is no longer all Disney, he now loves Adele, and I can dig that, and he is very much into tUne-yarDs, also wonderful, and there is also Mumford & Sons and The Avett Brothers and Bon Iver which we listen to as we make pancakes on the weekend, and some of this is his influence, and some of it is still that of co-workers and friends who keep making suggestions and burning me discs, and while much of this is new music, it is also more mellow, maybe, and possibly more popular as well, and it makes me wonder if I am slowly drifting into a life more mainstream than ever, propelled by parenting and age, and the inability to come up with the energy needed to explore new things? Of course, as I look back on the writing of Lucky Man, my own move to California, the drugs and the dead, I am also aware of just how little I feel like I need to bust out of some kind of box I don't want to be in, because for the most part I no longer feel like I'm in one I need to bust out of. All of which is to say, I am looking back, but I am also looking at now, and I am trying to make sense of something, nostalgia, emotions, decisions made and not made, and what the music means to me, the characters I write about and the stories we tell.